When its $100m transformation is complete in February 2019, Florida’s Norton Museum of Art will be a “museum in a garden”, says Norman Foster, the scheme’s architect. 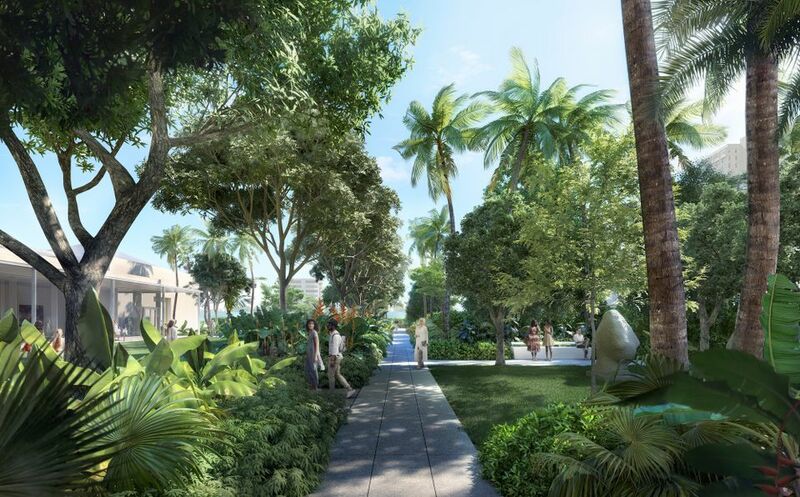 The latest plans for the expansion of the West Palm Beach museum, unveiled by Foster + Partners in New York last week, show three light-filled white stone pavilions set within a lush subtropical landscape, the British firm’s first-ever public garden. The Norton embarked on the project in 2013 to raise its national and international profile, make more space for its collections and programming and create a beautiful gathering place for the local community. Foster’s new West Wing, which broke ground in February 2016, will increase the exhibition space by more than a third (12,000 sq. ft) and add a 43ft-high Great Hall. The museum will remain open throughout the works. The extension aims to bring a clear, symmetrical order to the museum’s 6.3-acre campus, which had become a hodgepodge of structures located in a car park. A new entrance and forecourt along the main thoroughfare, South Dixie Highway, will re-establish the axial layout of the Norton’s original 1941 Art Deco building, designed by Marion Sims Wyeth. An 80-year-old, 65ft-tall banyan tree and Claes Oldenburg’s sculpture Typewriter Eraser will greet visitors at the entrance. The landscaping will echo the architectural structure of the museum, with a series of gallery-like “garden rooms”. Defined by trees and hedges, these will show thematic groupings of sculptures by Keith Haring, George Rickey and Mark di Suvero, among others. A new great lawn will host the museum’s popular Art After Dark programme of weekly evening performances, film screenings and other events. The Norton and its construction site survived the impact of Hurricane Irma well thanks to its elevated location inland, according to Foster + Partners. The firm’s Michael Wurzel noted only that a banyan tree in the grounds “got a haircut” and some ductwork in the roof needed to be replaced. The architects have not planned any special storm protections for the extension beyond the requirements of the Florida building code.